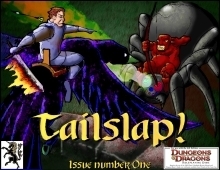 Tailslap is a new 4th edition magazine of articles detailing new characters, creatures, magic items, encounters, spells, powers, rituals, plot hooks, adventure seeds, playable classes, races, campaign settings and area descriptions for use in your games. We also like to mix in cool little details and intriguing features that will enrich your game world. These features are intended to be ready for you, be you player or gamemaster, to drop into your games as you see fit. In addition, many of these articles will combine to form complete adventures and campaigns that you can play. We work hard to make this material as easy to use as it is fantastic, and we hope that you enjoy using it in your games. To this end Tailslap is formatted in landscape for easy online reading.